September 22, 1999, L. G. Crabo. Sympistis augustus is a small to medium-sized moth (FW length 13 - 16 mm) with a mottled gray-brown forewing with a slight red tint, pale veins, filling of the spots, and subterminal line and a white hindwing with a patchy brown submarginal band that flies in steppe north of the Blue Mountains during the fall. The forewing is darkest in the median and terminal areas. The cubital vein and its branches are pale gray from the base to the subterminal area, vein A1+A2 is pale from the antemedial line to the mid-subterminal area. The antemedial line is pale brown medially and black abutting the median area. It is zig-zagged on the veins and oriented perpendicular to the wing. The median line is faint gray or absent. The postmedial line is black at the median area and pale brown laterally, weakly scalloped, irregularly excurved near the cell with the apex near the costa and then strongly oblique toward the base below the cell. The subterminal line is pale brown, irregular, appearing as a series of pale chevrons near the margin. It is preceded by gray to black lines or wedges between the veins that are strongest on the posterior wing. The terminal line is dark gray basally and pale distally. The fringe is brown-gray. The forewing spots are thinly outline in black, filled with pale brown peripherally and the ground color centrally. The orbicular spot is round and the reniform spot is half-moon shaped. The claviform spot is less prominent than the other spots. The hindwing is pure white with a patchy brown marginal band that is usually incomplete near the outer margin and gray veins, faint discal spot, and incomplete postmedial line, and thin terminal line. The hindwing fringe is pure white. The top of the head is tan. The fringe is tan with a black basal line and brown edge. The rest of the thorax matches the forewing color. The male antenna is filiform. 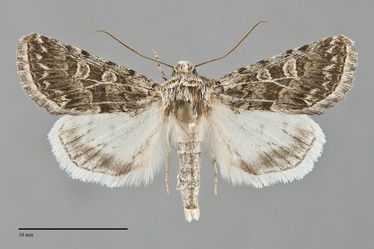 Sympistis augustus can be distinguished from other fall-flying Sympistis species with similar forewing color and pattern such as Sympistis sesmu and Sympistis seth by the patch hindwing marginal band, dark gray and solid in the other species. It could potentially be confused with a desert Euxoa such as Euxoa mitis but differs in details of the forewing and hindwing patterns. No Euxoa has a pure white hindwing with a brown marginal band like that of S. augustus. This species occupies dry short-grass prairie on the Great Plains, dry grasslands at low elevations east of the Cascades within the Columbia Basin, and juniper woodlands and sagebrush steppe along the east slope of the Cascades at middle elevations. Sympistis augustus is fairly widely distributed in the dry interior of the Northwest south of British Columbia where it has been found in the Rocky Mountain Trench and at Kamloops in the southern interior. Most of the records are from the Columbia Basin. 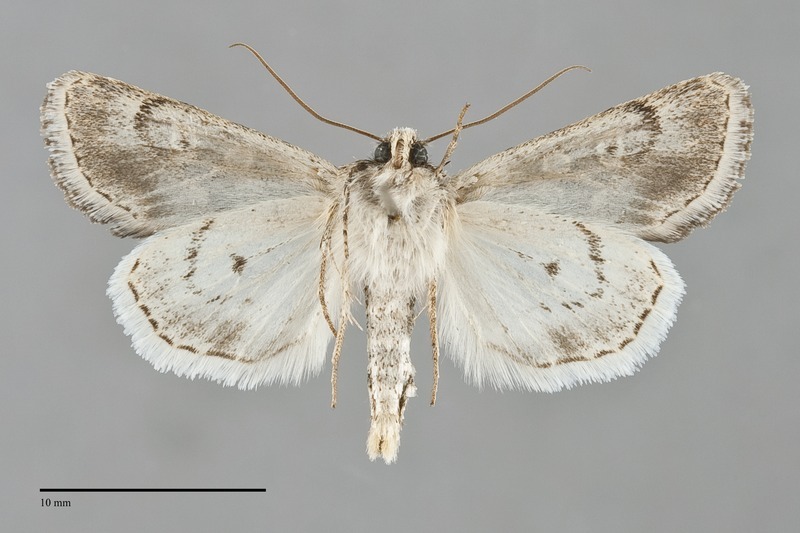 Interestingly, there are no records of this moth from southern Oregon or Idaho. This species is found on the western Great Plains and in the Southwest outside of our region. It has been collected as far north as central Alberta. No information is presently available regarding larval foodplants of this species, but penstemons (Penstemon spp.) in the Scrophulariaceae are suspected based on the habitat. Adults fly during the fall and have been collected from late August to early October in our region. They are nocturnal and come to lights.